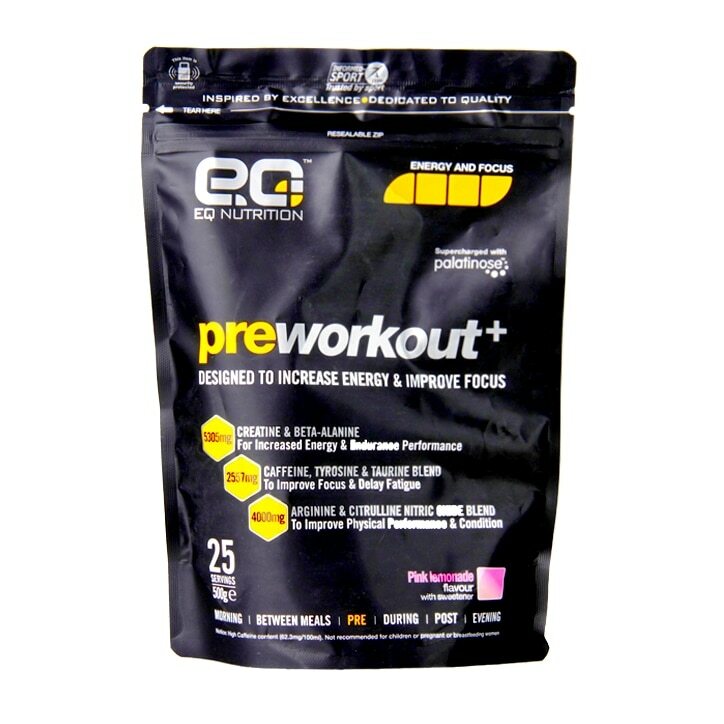 Preworkout+ is an advance formulation designed for those looking to increase energy and improve focus leading into exercise or periods of intensity work. Combining research proven ingredients in the correct amounts, this product can elevate your training sessions through several different mechanisms in order to boost performance and increase workload within the gym to help you reach your goals quicker. For best results use one serving of Preworkout+ approximately 30 minutes before training or exercise. Add 1 scoop (20g) to approximately 400ml of ice cold water in an EQ Nutrition shaker, shake and consume. Do not consume after 8pm and do not exceed more than one serving per day. Dextrose, Creatine Monohydrate, Beta-Alanine, Isomaltulose*, L-Arginine Alpha Ketoglurate (AAKG), L-Citrulline Di-Malate, Taurine, N-Acetyl L-tyrosine, Highly Branched Cyclic Dextrin - Cluster Dextrin Flavour, Acid (Citric Acid E330), Caffeine Anhydrous, Natural Colouring Agent (Beetroot Powder E162), Sweetener (Sucralose E955), L-Theanine, Anti-Caking Agent (Calcium Silicate E552), Inulin, Fructo-Oligosaccharides, *Isomaltulose (Palatinose) is a source of Glucose and Fructose. EQ Nutrition products are screened for banned substances in accordance with the Informed Sport and Informed Choice programmes. This gives you complete assurance that our products are of the highest quality and safety. Visit eqnutrition.com to learn more about our quality standards. EQ Nutrition Pre Workout+ Pink Lemonade is rated 5.0 out of 5 by 3. Rated 5 out of 5 by Patrickstyles1976 from Refreshing and actually works Using this I have noticed that I can dig deeper and go those few additional reps. The taste is great and refreshing. This ticks all the boxes for a pre for me. It's Informed Sports tested too.